I’ve never been to Buenos Aires, but I very much want to visit. 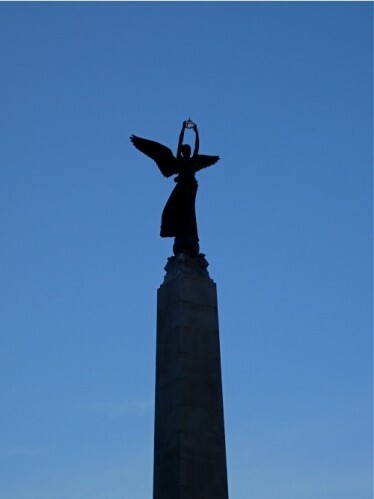 That’s largely because of the city’s architecture and art and music (those who know my darker, crime-fiction-writing side will also understand my interest in seeing Recoleta). My curiosity has been piqued in the past couple of years because it seemed that Argentina’s capital city is a great destination for the gluten-free. Silvia Basualdo Róvere has sent information about restaurants that serve gluten-free food (in this post and in this one). Also, the group Ley Celíaca (Celiac Law) has been very successful in passing legislation to increase awareness and accessibility for celiacs. I’m sorry to break your illusion, but Buenos Aires is not a celiac paradise by any means. This has been the experience of our celiac family that has now lived in Buenos Aires for five months. Almost any restaurant that has ever heard of the celiac disease or is asked whether they make food suitable for celiac people or if they have anything on the menu without flour will tick the box in Guia Oleo, but that doesn’t mean that you could actually get that kind of food in the place, at least not easily. Practically nobody knows anything about the celiac disease, gluten, or wheat. Weird stares ensue whenever we go to a restaurant and start the story. Often a waiter will happily bring us a (normal wheat) bread basket just after the five-minute discussion of what could we possibly eat, how we cannot eat even crumbs of wheat etc. There are a couple of exceptions that are the places recommended by the local celiac associations: Te adoro Garcia, Comer en compania, Zona natural and perhaps one more. But these are actually just cafeterias / bars that are not even open in the evening and that serve a very limited selection of lunches, typically heated up in the microwave. And I am not kidding. The times we ate in Te adoro Garcia and Comer en compania the food was OK, but it’s definitely not the kind of restaurant experience that a healthy person can easily enjoy in Buenos Aires. The reality is that there is not a single restaurant in Buenos Aires where a celiac people can go out and dine as well and safely as in Helsinki, which is where we lived before. One thing that limits the choice a lot in the normal restaurants (all except those three or four) is, that in this country, wheat is everywhere. Everybody is certain that normal cheeses and sausages contain wheat flour and definitely must not be eaten — there’s a couple of brands that are safe, and that are enlisted in the lists of the local celiac associations. It’s practically certain that any restaurant will not use these brands but something else. But what’s the most amazing thing that according to celiac people, doctors and associations in here, even normal spices contain gluten. As you can imagine, in the end this leaves one with pretty little choice. The most ubiquitous safe bet is grilled meat and salad (you just have to make sure they don’t put pepper or other spices in the salad). Other than that, some peruvian restaurants, which there are a plenty, can prepare some of their dishes such as ceviche and parihuela without using any dried spices. The celiac law is not enacted in Argentina yet which means that the packagings cannot be trusted. The gluten-free symbol or failure to mention wheat in the ingredients does not have any legal consequences before the law is in place, which I understand will take some time still. I’m always suspicious of sweeping statements, such as “the reality is that there is not a single restaurant in Buenos Aires where celiac people can go out and dine as well and safely as in Helsinki.” But Timo’s letter raises a number of interesting points: Do restaurants in Buenos Aires that identify themselves as celiac-friendly actually try to give gluten-free patrons rolls made from wheat? Do they not know what celiac disease is when you visit them? Is wheat so ubiquitous in Argentina that it’s in most cheeses and spices? Is it very difficult to get a good gluten-free meal there? Are celiacs limited to eating in cafeterias and luncheonettes? When I visited Chile, I found a number of gluten-free products that had been made in Argentina on supermarket shelves. I tried many of them, and even brought some home with me because I was impressed by the quality. They certainly didn’t make me sick. Of course, the products I sampled represent only a tiny fraction of what would be available in Argentina now. Does the gluten-free symbol on a product’s packaging not truly indicate that it’s safe for celiacs? I know that the Gluten-Free Guidebook has many readers in Buenos Aires, and I would love to get your opinions on this subject. Also, I’d love to hear from anyone who’s traveled to the city (and through other parts of Argentina). What was your experience of dining gluten-free in Buenos Aires? REMINDER: The Gluten-Free Guidebook’s Reader Report Contest deadline is June 7, 2010. Complete details are here. Silvia Basualdo Róvere, the reader who provided such a wonderful list of Buenos Aires restaurants a few months ago, is at it again. Silvia has compiled a list of celiac-friendly eateries in and around Buenos Aires and put the information into a spreadsheet. Anyone who wants to view it can click through here. Silvia is a member of Ley Celíaca (Celiac Law), an organization that promotes the welfare of Argentina’s 400,000 celiacs. Gluten-Free Guidebook readers are invited to visit the group’s website at www.ley-celíaca.com.ar; Ley Celiaca also has an online forum. The site and forum are in Spanish and can also be read via Google. Thanks so much to Silvia for providing a wealth of information about Buenos Aires restaurants! A few of her latest recommendations are listed below. There are many more on the spreadsheet; just follow the link above to access it.